The amplifier (speakers) is powered by its own battery. The amplifier should be charged each night. 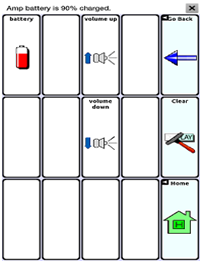 To check the battery status of the amplifier, program a button onto one of the vocabulary pages that contains a Battery Status Action. Pushing this button will display the battery status of the NOVA chat and the amplifier.